I pulled my Bus/RV to about 1/2 mile of the Freedom trail head at 3:00 am. It was chilly with no wind and no moon. I went to sleep quickly. I expected to wake up with the sun brightening my windows. By 8:00 am there was a still darkness out side. When I poked my head out the door to see what was going on I encountered a strange eeriness. The Sun was blocked by some large black clouds high in the stratosphere. It was still very dark and colder still than when I arrived. As soon as I dressed and packed I headed toward the springs. Stillness surrounded me on all sides. Even the birds and rabbits one usually encounter were gone. As if even they knew some thing strange was occurring. As I hiked I noticed the rain and wind from the day before had erased all signs of civilization. No foot prints, no tire marks, no litter, no birds chattering, No sound of anything at all. As if I had encountered a chapter from the Twilight Zone. No cars at the trail head either. Of course, I take all experiences as a positive encounter with nature. Just Lucky to be able to see this oasis in the desert as it was before crowds tracked it up. Now, I wish I would have taken a picture of the sand all pristine like it was. I finally encountered the ever present sound of Deep Creek as I hiked toward the springs. When I got to the springs No one was present again, again I had the springs all to myself. For about 15 minuets then some of the Deep Creek regulars appeared from every conceivable path. Never more than 25 people during the day. Mostly Male 20 somethings, until I left at 2:30 pm. Then many females began appearing. I have finally acquired another digital thermometer. They sell them at Smart and Final food stores. Where I was the day before. 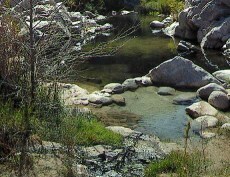 The Creek water just upstream from the Arizona pool was 48.8 degrees. That is the at same place I used to monitor the creek temps before. All temps are taken near the surface of the pools near their center. The Arizona pool was 102.5 degrees. It is over 1 foot deep and a good place to catch the suns rays. Which came out shortly after 11:00 am. The Anniversary pool was 102.7 degrees. Some one had let the shower hole open so I found the sock plug and closed it off. Later I rechecked the temp and it was 104.2 degrees. When the Sun did shine it was shining at this pool too. It was very clean and pristine soaking there. The Womb pool was 96.8 degrees when I first checked it. After plugging the Anniversary pool I rechecked the temp here also. It was100.5 degrees. I took my water goggles to see how clean the bottom was. I found a water bottle a beer cup, 3 beer bottle tops and some rubber bands ?, Other than that the bottom is pretty clean. The Serenity pool was a very nice 106.7 degrees. The depth there has been very nicely altered to make for a very nice soaking experience. It is now almost 4 feet deep. The Crab cooker pool was hotter than it used to be at 110.5 degrees it used to be at 108 degrees. At the spring where it used to be a fairly steady 114 degrees it is now 116.2 degrees. Makes me wonder ??? I could find no trash to take with me as every thing was beautiful as the sun was shining after 11:00 am. Mostly Male bantering around the pools until some local females showed up with the sun. Changed the dynamics of every thing, as usual. Then some more women and some more showed up. At 2:30 I began my hike back from the Twilight Zone and to this rat race of city life !